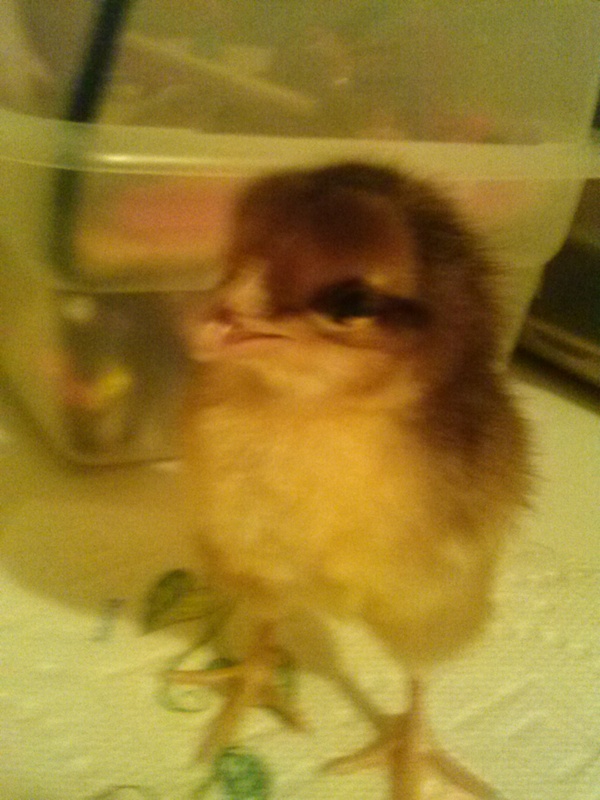 I received my chicks yesterday. They were shipped on Monday, and the two day journey in freezing temps was not good – the place I ordered from has a 15 chick minimum right now, until the end of March, for a very good reason – it’s meant to help them keep warm on the journey (more chicks = more body heat). They had a heat pack, and there were 16 chicks in my box. 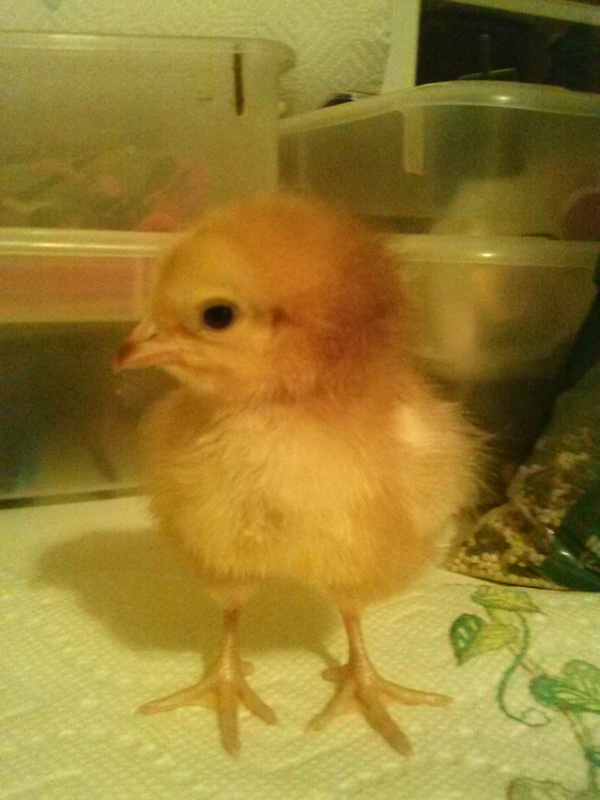 I got a call from the post office on Wednesday, and they said the chicks had arrived, but only 2 were alive. I ran to the post office, and there were two visibly alive – everyone else looked to be dead. The postal trucks are not heated at all. 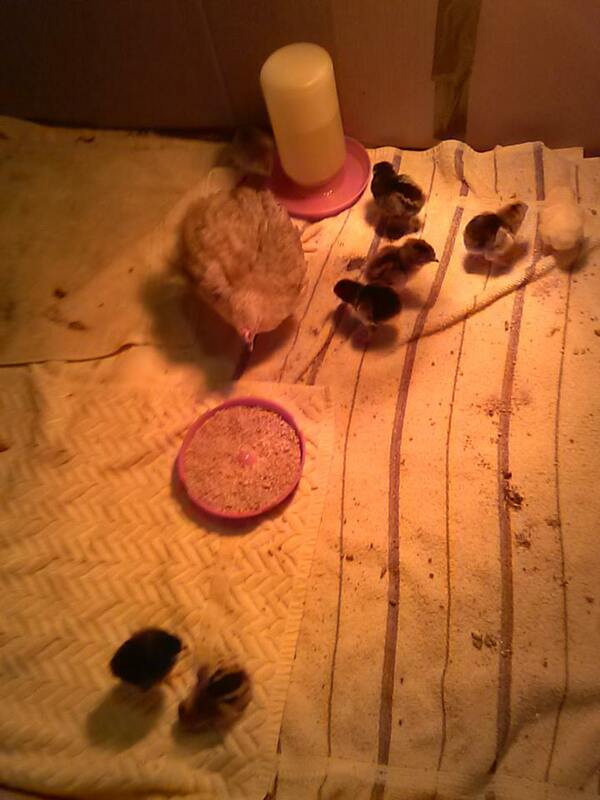 I ran them back to my office, and immediately put a heat lamp on them. Over the next couple of hours, 6 more of them woke up – so total of 8 alive, and 8 had died. I talked to the company I ordered from, and they said to call them back on Friday with the final total, just in case any more didn’t make it. I brought the 8 survivors home, and they all seemed to be doing well, until late last night. I noticed one little guy had one eye shut, and his peeping seemed to be weak. I went to bed, and had a dream that he had died (in my dream he was a little penguin, which I think is because I thought he looked like a penguin – he was a little black and white chick) – I woke up today and sure enough, he had died in the night. One other little orange guy was acting weak this morning, so I didn’t think he would make it either. About an hour later, just before leaving for work, I went to check on them and he had died as well. 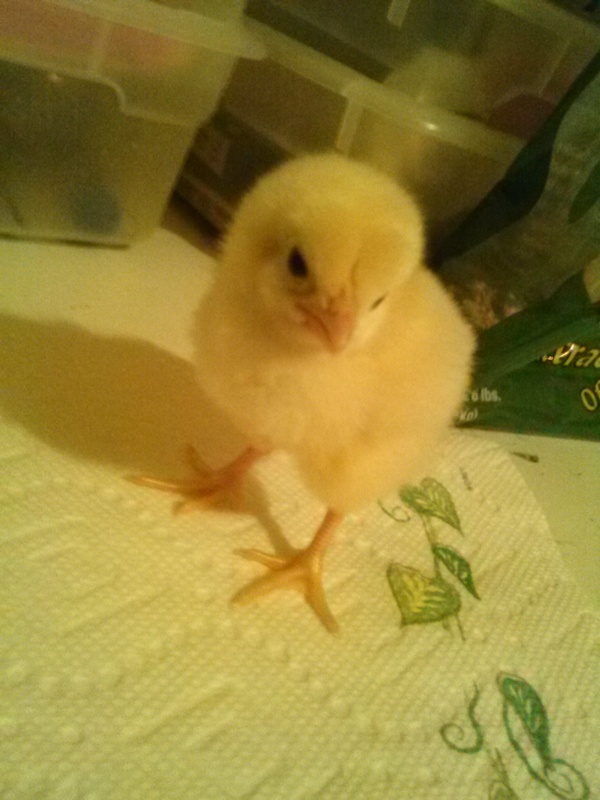 I now have 6 chicks. They seem to be doing really well, everyone is eating and drinking well, and running around in their giant box. They are getting along well with Peepers, although that was a little touch and go at first. 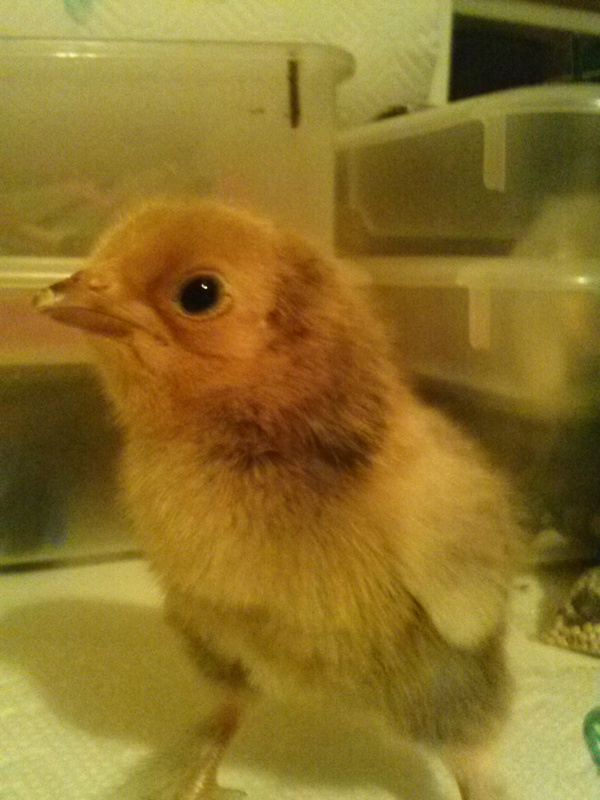 Luckily, poor Peepers can’t really move very fast due to his/her crippled legs, so they aren’t in much danger. They like to run up to her, peck at her feet, and then run away. (I’ve found myself calling Peepers a “she” lately instead of a “he” although I still have absolutely no idea what she/he is). One chick kind of nuzzled under her for a bit today. 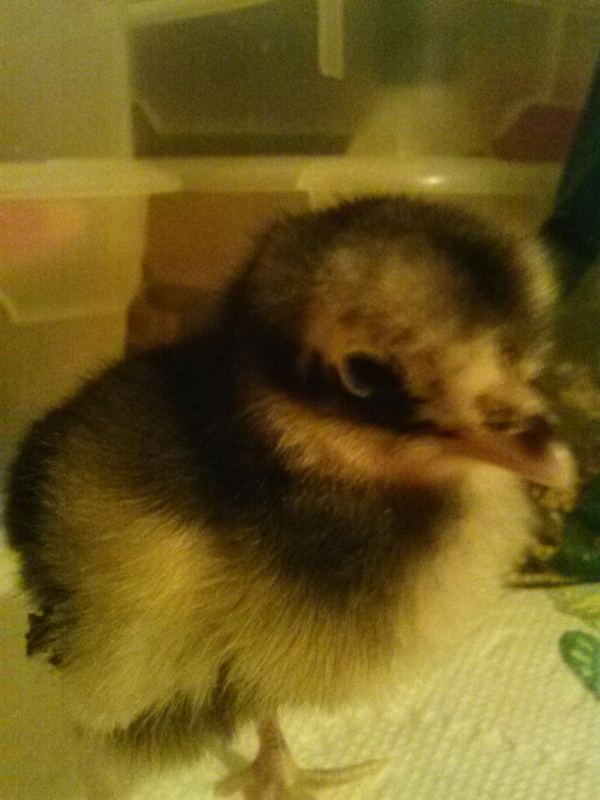 We’ll call this guy “Fighter” – the most strong willed of them all – he was the most awake when the box arrived, walking on top of everyone and pecking them all as if to say “wake up!” He also has fluffy feathered legs. Little Yellow guy – he is just SO cute. Little spotted “penguin” looking chick – this one has funny diagonal stripes on his face. Orange guy – this was the other Awake one when the box came. This one has an orange / brown mask on his eyes, and has a cool brown skunk-like stripe down his back. Little black chick – this one has a black and white skunk-like stripe down his back. I’ll have to see about getting the replacements for the losses sent in a month or so, when it’s warmer so that I don’t lose them as well. For now, these guys are doing well and are a lot of fun to watch. 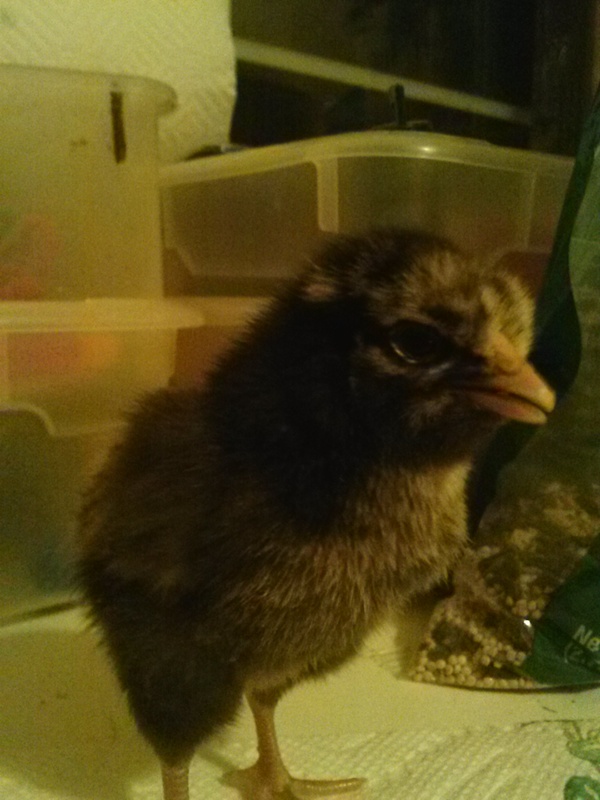 The chicks in their new home with Peepers. (Taken last night when there were still 8). Next Article Maple syrup time!